Insect eyes have something hypnotical. Their strange, intricate shapes and unusual large size, so different to other species, have kept entomologists busy explaining what makes them so unique. Now it looks like photovoltaic experts have also found a source of inspiration in them. 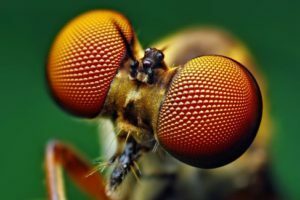 It is precisely the honeycomb shape of the arthropod eye which led a team at Stanford University to find a solution to improving the viability of perovskites, a promising, low-cost material that converts sunlight into electricity as efficiently as conventional solar cells made of silicon. As incredible as it may sound, perovskites could be the nature’s gift to providing us with endless clean energy. The problem? They are too fragile. Nicholas Rolston, co-leader and author of the study Scaffold-reinforced perovskite compound solar cells, explains: “Perovskites are the most fragile materials ever tested in the history of our lab. This fragility is related to their brittle, salt-like crystal structure, which has mechanical properties similar to table salt.” With these features, it became imperative to create a protective shield that could help perovskites survive their manufacturing process and the weather. Epoxy resin, once again, came to the rescue. Once the scientists had the suitable material, the insect’s eyes sparked the team’s creativity. 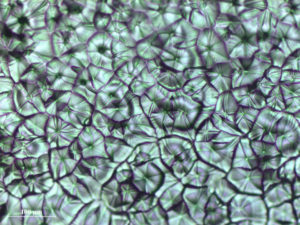 They built a vast honeycomb of perovskite microcells, each encapsulated in a hexagon-shaped scaffold made of epoxy. In their words, epoxies are readily available and resilient to mechanical stress without affecting the perovskite’s ability to convert light into electricity, and the honeycomb shape makes it possible that, in case one perovskite segment is lost, hundreds of others will still operate. The Stanford University team has already filed a provisional patent for this new technology that provides another example of how chemistry can help us make a more intelligent use of our natural resources. We hope to see epoxy-perovskite solar panels on our roofs very soon.